Not your typical banana pancake recipe for breakfast here! These are the ultimate banana pancakes thanks to banana flour, making them gluten-free, vegan, grain-free, and nut-free! Your Sunday mornings just got a lot more delicious! “WEDO (‘We Do’) Gluten Free began in the heart of Kenya when Co-creator David Wintzer was assisting a group of 25 women, Women Entrepreneurs Development Organization (WEDO) in granting micro-loans to start-up small business, one of which a banana flour factory. 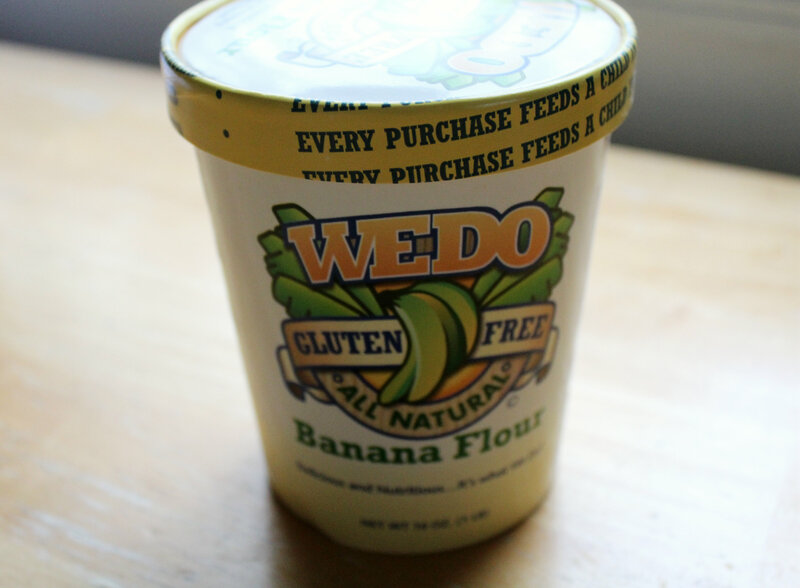 WEDO Gluten Free’s original and first supplier. After working with the group for almost two years WEDO Gluten Free knew it had to expand to other parts of the world if it wanted to meet the demand for a potential US market. Yes! Banana Flour? I was speechless. When I found out about this company, I mentioned them in one of my Friday Finishers and immediately put that flour on my list of things to buy and try. When I finally decided to spend my Amazon gift card from Christmas a few weeks ago, Banana Flour was put right in my cart. It’s a bit pricey, but well worth it since a little goes a long way! The nutritional stats are phenomenal and it’s totally gluten-free/grain-free. It is made with green bananas so it doesn’t taste like the sweet iconic banana flavor you’re thinking. That is until you bake it or cook it with some banana puree! Then the banana flavor comes out! The texture is light and fluffy, gives added nutrients, and has a high starch content which allows you to use less flour when cooking. In 1/4 cup you get the potassium of eating 12 bananas! In a bowl, add the flour, baking powder, and cinnamon, give it a mix with a fork. Then add in all the wet ingredients and banana mash. Mix until you have semi-thick pancake batter. Grease a non-stick pan with coconut oil and heat over medium heat on the stove. Once the pan is hot, Add about 1/3 of the batter to the pan. Cook for about 3 minutes, flip and cook and additional 3 minutes. Repeat for the rest of the batter. For the Peanut Swirl Sauce, add all ingredients to a small bowl and mix well. Add the water slowly so you get the right think but saucy consistency, you may need more of less. Plate the cakes and top with your sauce! *You can do 3 Tablespoons of banana flour and 2 TB of peanut flour if you want extra goodness! You may need to decrease or increase water as needed. These kept me satisfied all morning! Healthy, nutritious, vegan, grain-free, gluten-free, and filling? It can be done! You can eat these every day, all day and feel pretty good about yourself! You can top these cakes with traditional syrup, but isn’t banana and peanut butter one of the ultimate flavor combos? At least, that’s what I’ve heard! Now go make these ultimate banana pancakes! + Have you ever heard of or seen Banana Flour? + What’s your favorite alternative flour? « What Does A Day Of Gluten-Free Meals Look Like? These vegan and gluten free banana pancakes are such a healthy, tasty way to start the day. Oh this is really interesting! You know I love pancakes and I eat a banana to start the day each and every day. I’ve never heard of banana flour, I am definitely going to check this out. And my combo would probably be fresh sliced strawberries with a little chocolate sauce instead of peanut butter. But all of that sounds good to me. O but the peanut sauce is a must! It really is an amazing flour! You can make some amazing pancakes and baked goods with it! I had no idea banana flour was a thing! I will have to look for that. I didn’t know that banana flour actually existed! These pancakes look really delicious. I will see if I can source the banana flour in the UK to give this recipe a go. I hope you can get some online! It is the best! Wow I’ve never heard of banana flour, hope I can get some here! That’s the beauty of online shopping! I have never heard of banana flour and have not had much success with the other alternative flours. Coconut flour was a total disappointment. Maybe I would have better luck with this. Banana flour is the best grain-free! You don’t have to rely on icky eggs like coconut and almond! This for me is the perfect late Sunday morning breakfast. I’m bookmarking this one. My kids love bananas and pancakes. I bet they would love these. I will have to try them. It will be a great weekend breakfast! Yes, please!!! You need these in your life! Just wondering what I could substitute for the peanut flour. Can you help me please? Can’t eat peanuts on Paleo. Thanks for any help you can give me. ???? That’s an optional topping. It may help if you actually read the recipe. I have some of this banana flour and have been wondering what to do with it. Thanks for sharing your wonderful recipe! It is magic for pancakes!! How have I never heard of banana flour?! I think my boys would love these. Definitely need to give this a try, thanks for the idea! What a lovely combination of banana flavors! This looks sooooo goood!!! There’s a banana flour! I think you just changed my life! Already ordered. My curiosity trumped the price tag. Thank you Katy! I am happy I can spread the banana flour love! Banana Flour. How interesting! I’ll have to give it a try. Thanks for sharing at Savoring Saturdays! I have never, ever heard of banana flour! Very interesting. Is it new? It is as new as this innovative company has been around, so yes! I’m now dedicating my life to finding banana flour. Whoa. Yummy, but now I have a taste for pancakes. That flour looks great. Haha, go and make some pancakes ASAP! I have a wheat allergy and this flour sounds so tasty. Thanks for sharing it with us on Foodie Friday. I’ve never heard of banana flour. yay! Another gluten free option! Wow banana flour – I had never heard of that before but sure sounds like a great idea. This pancake recipes looks and sounds delicious. Thanks for sharing on Real Food Fridays Blog Hop! I have a friend who can’t do gluten. I’m sure she would love this! Those look incredibly delicious!!!! I have only ever had banana pancakes at IHOP…. I need to look into making these! This post made me hungry! These look and sound SO good! I did not know that banana flour existed, but I am definitely thinking about buying some now. I am sure the banana/PB flour combo is awesome since bananas are so good with peanut butter! That’s what I was aiming for! The famous banana PB combo all in the best food out there…PANCAKES! You are missing out! Make these babies ASAP and you will love bananas even more, haha! It’s great to learn about new foodie things, the pancakes sound delicious. Got to share the love, right! this is the first time i see Banana Flour. I once saw banana pancakes made with a banana that was smashed. I have to say these pancakes look delicious, i want to try them with dark chocolare sprinkles. And omg, apple flour sounds delicious!! I was about to say chocolate flour, but i guess that it’s similar to cocoa, right? Haha, yes! But Cocoa pancakes are the bomb 😉 Anything with cocoa powder is my fav! Definitely had never heard of banana flour but would love to try it, along with these pancakes. I love bananas, so I’m sure it’d be a winner in my book. Definitely! Like I said, the ultimate banana pancakes…for the ultimate banana lover! I’ve never heard of banana flour but glad I clicked over because these pancakes look fantastic. It’s so amazing, all the different kinds of flour there are available these days! I’m curious about the sugar content- looking at the nutrition label, it says only 1 gram. I thought bananas were a high sugar fruit? They use green bananas, so the sugar hasn’t really formed yet! I’ve never heard of banana flour but the pancakes look delicious. I think I’d love to see an apple flour. Apple pancakes sound pretty good. Really any fruit flour would be steller, ey? Now you can use flour and still keep it Paleo! Yum I want to try these! Time to get banana flour! Banana flour?!?!!? Life changer! That sounds amazing! MMmmm I bet those pancakes would be great! You are so right about small start up companies, I try to use them as much as I can, supporting the little guys, and finding some great new products! Haha, a total life changer! These smaller start ups are always the go-to people for unique allergy-friendly gluten-free foodie finds! This sounds totally aazing! I can’t bake pancakes to save my life, but I’d love to buy bana flour to have someone bake some for me. Haha, I guess if you use the word “bake” when talking about making pancakes, I can see the problem Haha, but give these a try, it really isn’t hard! Just make sure you pan is really non-stick/oiled, and start by making small sized pancakes! It will be easier to flip until you get the hang of it! This stuff is crazy awesome! I love all the cool start-up companies you can find on Kick Starter, and it all came for a good cause too!